In this guide will be explained how to work with Suricata in layer3 inline mode and how to set iptables for that purpose. First start with compiling Suricata with NFQ support. For instructions see Ubuntu Installation. For more information about NFQ and iptables, see NFQ. and examine if you have NFQ between the features. To run suricata with the NFQ mode, you have to make use of the -q option. This option tells Suricata which of the queue numbers it should use. First of all it is important to know which traffic you would like to send to Suricata. Traffic that passes your computer or traffic that is generated by your computer. 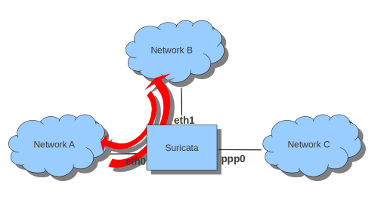 If Suricata is running on a gateway and is meant to protect the computers behind that gateway you are dealing with the first scenario: forward_ing . If Suricata has to protect the computer it is running on, you are dealing with the second scenario: host (see drawing 2). These two ways of using Suricata can also be combined. In this case, all forwarded traffic goes to Suricata. It is possible to set a queue number. If you do not, the queue number will be 0 by default. In this case, Suricata checks just TCP traffic. In this example, Suricata checks all input and output on port 80. In the example you can see if packets are being logged. This description of the use of iptables is the way to use it with IPv4. To use it with IPv6 all previous mentioned commands have to start with ‘ip6tables’. It is also possible to let Suricata check both kinds of traffic. If you would stop Suricata and use internet, the traffic will not come through. To make internet work correctly, you have to erase all iptable rules.